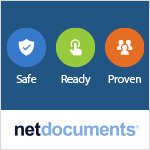 NetDocuments, the leading cloud platform for legal IT, announced today it has completed the proof of concept of the integration of NetDocuments’ cloud platform with blockchain technology, enabling firms to validate document existence, details, status, and metadata via a verified and distributed digital ledger. Incorporating blockchain technology into NetDocuments’ governance platform enables sensitive and transactional documents to be verified by posting to an open-source digital ledger, validating document details such as canonization, approval, status, filing and other relevant document information. Verified documents will retain a blockchain ID, ensuring accuracy through a distributed digital trust network. The technology integration includes blockchain certification of content stored in NetDocuments as well as certification of contents in local device storage. "Blockchain represents a new wave of innovation in the architecture of highly trustworthy systems. I believe it can cause transformation and disruption for the legal ecosystem at large and enable a whole new way for corporate counsel to manage their legal operations," commented Bob Craig, CIO at BakerHostetler and NetDocuments customer. 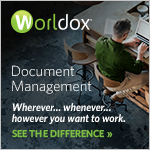 "I'm thrilled that NetDocuments has proven once again they are innovators and that they have embraced this new technology in such a bold way." NetDocuments’ blockchain integration allows customers to initiate a range of workflows and will support multiple blockchain platforms. For example, establishing an NDA (non-disclosure agreement) can be performed by distributing a NetDocuments link, verifying the parties have not altered the agreement and then publishing the final agreement through the NetDocuments-Blockchain integration.